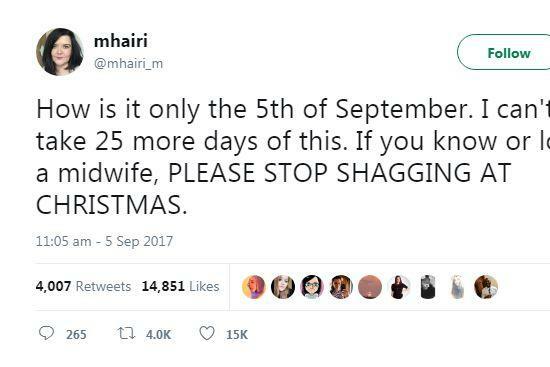 Exhausted midwife's plea: "Please stop shagging at Christmas"
A totally knackered UK midwife is urging parents-to-be to keep their hands off each other during December, because it’s resulting in an overwhelming boom of babies the following September! Other healthcare professionals chimed in, confirming that there are many mums to be juggled and many babies to be snuggled at the time of year and they’re finding it all to be A LOT. “Hear hear from the Paeds doctor doing baby checks,” Vicky Thornley wrote. “Amen! I work in maternity and damn,” Dee Thumbelina tweeted. Guilty-as-charged parents began apologising almost immediately. “I’m so sorry, my first child was a September baby. The midwife on the ward was nearing a breakdown. I can’t apologise enough,” Eliza Doodle posted. “Fair enough. As someone due in 3 weeks, I apologise for adding to your distress,” mum-to-be Kimberley wrote back. The UK has seen an overall increase in birth rates in September, with offical stats revealing that Christmas is to blame. “There is a rise in births in September, and according to figures recorded between 1995 and 2014, September 26 is the most popular day to give birth with an average of 2,000 deliveries. The day falls 39 weeks and two days after Christmas Day,” The Evening Standard reports. Further, a baby conceived on Christmas Day will have a due date of 17 September, so you can see that December brings all the September babies to the birthing suite. This tired midwife has only dipped her toe in all September has to offer, really. More babies are coming! Is it the same story in Australia, with birth rates peaking around 40 weeks after December 25th? The official numbers from the Australian Bureau of Statistics tells us that in Australia, babies conceived in January push October to the busiest month for births in the most recent full year of stats. While we’re approaching from very different circumstances, the UK shivering through December and January, as we begin the sweltering season here, the results are pretty similar, if a month or so apart. So it would seem that the holiday period is sparking conception, whether that’s due to opportunity, mood or lots of cocktails is anybody’s guess! AND weather extremes could be contributing too, with couples staying indoors in their own controlled climate doing the whole weather avoiding Netflix and chill type thing. What’s your expert theory on these September/October baby booms?! Are you having a September baby?